A March 2016 indication of the cosmos coming back to life as scientific teams quantify how physical matter is graced by an innate, self-organizing spontaneity. The cover article is The Fertile Physics of Chemical Gardens by Oliver Steinbock, Julyan Cartwright and Laura Barge. An extended analysis with many colleagues appears as From Chemical Gardens to Chemobrionics in Chemical Reviews, also reviewed herein. How Does Life and the Universe Organize Itself?. www.huntsman.com. A site for Huntsman Advanced Materials – when accessed, type Lehn into its search box. An extensive news report on a February 21, 2008 talk in Basel by Nobel chemist Jean Marie Lehn on the revolutionary frontiers and implications of supramolecular chemistry, a field he founded. This advance which perceives material nature to possess a deep propensity for self-assembling dynamics not only promises many novel technologies but implies a profoundly different kind of animate cosmos with its own innate vitality. By intentionally facilitating these qualities of prior, innate self-organization and later selection, human intention can continue this emergent creation. Constitutional dynamic chemistry introduces a paradigm shift with respect to constitutionally static chemistry. Whereas self-organization by design strives to achieve full control over the output molecular or supramolecular entity by explicit programming, self-organization by selection operates on dynamic constitutional diversity in response to either internal or external factors to achieve adaptation in a darwinistic fashion. By extending its characteristic features, supramolecular chemistry is thus leading towards the emergence of adaptive and evolutive chemistry. At the end of the lecture, the forum was opened for Questions and Answers; and the final question asked was, “After all you've achieved, where do you go from here?” To which Professor Lehn responded that our knowledge today is in its infancy and the Holy Grail remains a full understanding of self organization as a universal phenomenon. Supramolecular Chemistry. www.nature.com/collections/wypqwypccc. A collation from the daily Nature Communications site of contributions to this 21st century scientific frontier. Its contents come in four categories: Physical Principles, Discrete Assemblies, Materials Design and Systems Chemistry For a sample, see Self-Selection of Dissipative Assemblies Driven by Primitive Chemical Reaction Networks by Tens-Solsona, Marta et al, Rich Complex Behavior of Self-Assembled Nanoparticles Far from Equilibrium by Serim Ilday, et al, and Chemical and Entropic Control on the Molecular Self-Assembly Process by Dan Packwood, et al. Some other collections are Complexity Research and Developmental Biology. Supramolecular chemistry specializes in non-covalent interactions. These weak and reversible forces—such as hydrogen bonds, hydrophobic forces, van der Waals forces, and metal–ligand coordination—are key to understanding biological processes and self-assembling systems, and to constructing complex materials and molecular machinery. In the several decades since its conception, supramolecular chemistry has become a truly interdisciplinary research area, providing insights into and spurring developments across biology, chemistry, nanotechnology, materials science, and physics. In this collection, we highlight a selection of recent experimental and theoretical studies published in Nature Communications, which we hope reflect the true breadth of supramolecular chemistry as a discipline. The collection features advances in building discrete assemblies and extended material systems, all through the clever design of non-covalently organizing components. Systems Chemistry. www.grc.org/systems-chemistry-conference/2018. A Gordon Research Conference over July 29 – August 3, 2018 at the Jordan Hotel at Sunday River Ski Resort in Newry, Maine, a fine summer venue. Notably, it is the first international meeting of this nascent field as it evokes a dynamic materiality akin to other realms of an ecosmos genesis. Some sessions are Bottom-up Construction of Complex Chemical Systems, Chemical Networks, Alternative Genetic Systems, Autocatalysis and Self-Replication, Chemical Reactivity Far from Equilibrium and so on. And the whole cast of advocates seem in attendance with David Lynn, Goren Ashkenasy, Sibren Otto and Rein Ulijn as Chairs onto main presenters Sara Imari Walker, Kepa Ruiz-Mirazo, Christine Keating, Henderson Cleaves, Niles Lehman, Jennifer Heemstra, Lee Cronin and more. Andersen, Jakob, et al. An Intermediate Level of Abstraction for Computational Systems Chemistry. arXiv:1701.09097.. Andersen and Daniel Merkle, Earth-Life Science Institute, Tokyo, with Christoph Flamm and Peter Stadler, University of Vienna, introduce a Network View of Chemistry to expand this systems view. Life’s origin and a “universe of chemical compounds” are then be better appreciated. Annila, Arto and Erkki Kolehmainen. On the Divide between Animate and Inanimate. Journal of Systems Chemistry. Online February, 2015. As the biological and physical sciences become (re)unified, University of Helsinki and University of Jyvaskyla, Finland, scientists contend, informed by new realizations of nature’s integral self-similarity, that this artificial, untenable separation and divide of inorganic and organic can at last be removed. Ashkenasy, Goren, et al. Systems Chemistry. Chemical Society Reviews. 46/2543, 2017. GA, Ben-Gurion University of the Negev, Thomas Hermans, University of Strasbourg, Sijbren Otto, University of Goningen, and Annette Taylor, University of Sheffield introduce and survey an update collection on this integrative advance. For a flavor, some topics are dissipative non-equilibrium self-assembly, autocatalysis, and open-ended evolution. Among the papers are Exploring the Emergence of Complexity using Synthetic Replicators, Assessing Cooperativity in Supramolecular Systems (search Krbek) and Supramolecular Chemistry by the Nobel chemist and conceptual founder Jean-Marie Lehn. Banzhaf, Wolfgang and Lidia Yamamoto. Artificial Chemistries. Cambridge: MIT Press, 2015. Memorial University of Newfoundland and University of Strasbourg interdisciplinary scientists achieve a 600 page resource for the multifaceted complex natural systems project which lately spans physical, evolutionary, biological and societal domains. The work opens by saying it has little to do with chemicals, but is all about the interactive dynamics between material entities from cosmos to culture. The title term has currency in the broad computational turn along with other evolutionary, genetic, neural net, and algorithmic versions. Its special contribution is an advanced, inclusive, insightful synthesis of the nascent field as it tries to express an intrinsic, universally recurrent program code that seems to be running everything. As the quotes convey, the endeavor is distinguished by an initial explication, albeit in abstract terms, of spontaneous complex adaptive networks, unto a better, intentional future as their creative utility may now pass to our comprehension. A 50 page bibliography with 959 entries is a copious guide in itself. See Banzhaf’s publication page for some two decades of writings on many facets such as genetic programming, molecular computing, and bioinformatics. Barge, Laura, et al. From Chemical Gardens to Chemobrionics. Chemical Reviews. 115/8652, 2015. A 21 member international collaboration including Alan Mackay, Anne De Wit, Florence Haudin, Leroy Cronin and Julyan Cartwright write a scientific treatise of 50 pages and 275 references which covers historical studies of these spontaneous plant-like material forms from the 17th century to this 21st century resolve. As the quotes describe, the sciences of complex, self-organizing systems can now provide the theoretical explanations for their occasion. As the paper goes on, a major benefit is a better sense of an inherent prebiotic origin of life by virtue of these dynamic phenomena. 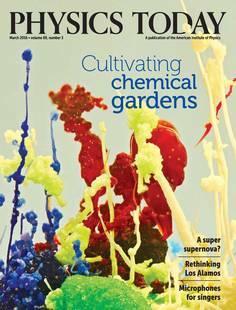 For a popular review see The Fertile Physics of Chemical Gardens by Oliver Steinbock (search) et al in Physics Today for March 2016. In the mid 2010s, an emergent humankind seems at last able verify and discover an organic genesis cosmos. Behler, Jorg. Neural Network Potential-Energy Surfaces in Chemistry. Physical Chemistry Chemical Physics. 13/17930, 2011. A Ruhr University Bochum theoretical chemist finds these cerebral dynamic topologies to be readily adaptable to chemical phenomena. See also Neural Network Molecular Dynamics Simulations of Solid-Liquid Interfaces by Suresh Natarajan and Behler in the same journal (Online September, 2016), and Constructing High-Dimensional Neural Network Potentials: A Tutorial Review by Behler in International Journal of Quantum Chemistry (115/16, 2015). Boeyens, Jan. The Grand Periodic Function. Scerri, Eric and Guillermo Restrepo, eds. Mendeleev to Oganesson: A Multidisciplinary Perspective on the Periodic Table. Oxford: Oxford University Press, 2017. In a latest volume on nature’s auspicious array of chemical elements, a chapter by the University of Pretoria chemist (search) which notes its structural essence. If of a mind, an independent geometry, a “cosmic self-similarity” with Fibonacci sequences, becomes evident. In regard, a science lecture hall at nearby UM Amherst has large wall PT on display. By any stretch this fecund materiality from which we arise and wonder is not an accident, but we cannot realize due to cultural constraints. And we should note that the title names – Dmitri Mendeleev (1834-1907) and Yuri Oganessian (1933- ) discoverer of the 118 atomic number - are a Russian chemist and physicist whose national country, as also America, yet seems bent on nuclear confrontation.